The headline of this article might seem odd, because it implies that Beacon's City Council was not in favor of short-term rentals (aka Airbnb or home-sharing). Council members actually largely did support homeowners renting out their homes to earn extra income. The night of the vote, homeowners who rent out spaces via the Airbnb website had come to the City Council meeting to ask the Council members to vote against the legislation that the Council had been crafting to legalize short-term rentals in Beacon based on the public's input for the past several months. In a vote of 3-4, with Mayor Randy Casale, Jodi McCredo, and Lee Kyriacou voting "Yes" to legalize short-term rentals, the rest of the Council voted "No." After tallying the votes, the Mayor announced: "The law does not pass. What that means is that all short-term rentals are illegal in the City of Beacon." The resulting silence was stupefying. It lasted for 24 seconds. The night had been set up for the vote to pass. Homeowners and people who cleaned short-term rentals had shown up to demonstrate their support for short-term rentals - yet asked for a "No" vote. 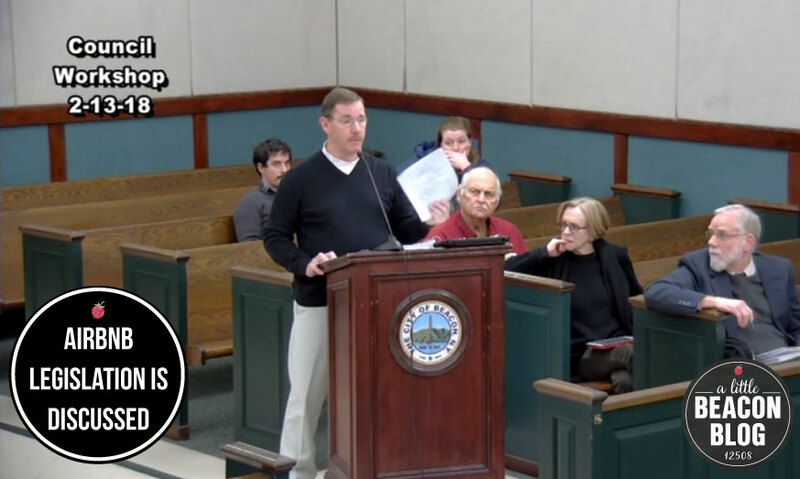 They then got that "No" vote, along with the declaration that short-term rentals were illegal in Beacon because there was essentially no law at all in the first place to protect them. Editor's Note, 6/1/2018: By default, short-term rentals in Beacon were prohibited, so they were never allowed in the first place (hard concept to grasp, but we explain below), nor had any protections. This legislation would have legalized them, and required them to get a permit. The other would have urged New York State to set its zoning code for short-term rentals, and separate short-term rentals from being classified as Bed and Breakfasts. At the state level, that classification requires that homes have sprinkler systems or egress windows for fire safety. Why Now? Why Are Short-Term Rentals Being Contested? Beacon’s City Council has been debating how to legalize short-term rentals since December 2017, after a Beacon resident and new owner of 51 Orchard Place cut down 13 trees in his yard without a permit, and listed the home on Airbnb. Some of his neighbors were enraged (others supported the tree removal), and brought to the City Council their concerns that homes in neighborhoods were being purchased not as primary residences, but as investment properties (aka "non-owner occupied"), thus altering the neighborhood feel. Those against his listing of the Orchard Place property on Airbnb presented a petition to ask the City to define regulations about short-term rentals, but not stop the practice entirely. Neighbors were demanding that the City enforce that short-term rentals be illegal in Beacon, but there wasn't an ordinance either way about whether they were allowed or not. Hence the default to the rule that the City Attorney mentioned above. The legislation that the City Council crafted (after several rounds of drafts) essentially legislated this house out of being a short-term rental because it was not the owner's primary residence. This home has since been unlisted from Airbnb, and put on the market for an asking price of $699,900. The Zillow estimate of the home is $412K. Wait, What? Short-Term Rentals Are Illegal in Beacon? According to a letter submitted by Airbnb to the City of Beacon, in 2017 alone, over 9,100 people stayed in Beacon in an Airbnb. Also in 2017, Dutchess County took in over $220,000 in taxes from the 4% Bed Tax paid by Airbnb on behalf of its homeowner hosts, according to Dutchess County Legislator Nick Page, who we reached out to for numbers. Based on those stats, there are far more people coming to stay the night in Beacon than there are hotel rooms to house them in Beacon or in Fishkill. There is a huge supply of people coming to Beacon to stay the night. Other cities have been operational in the home-sharing market, but in an unregulated or protected way. For instance, in a suburb of Columbus, OH, called Upper Arlington, Airbnb was beginning to thrive, as people would seek to stay there when visiting for Ohio State University games. Last month, Upper Arlington voted to make all short-term rentals illegal, and stated to revisit it in one year. Beacon had been drafting a law to allow short-term rentals (see our highlights of what was in or out here). Some topics that were addressed included possible limits on how many days a property could be rented, and what spaces were not rentable - attics, or basements, or RVs and tents in backyards. Other cities do have a limit on the number of nights homeowners can rent out, and Beacon started with a 100-day maximum, but during a public meeting, Council Person John Rembert suggested that the council revisit that after hearing public pushback against the maximum. The City Council did throw out that maximum. See the final version of the law here for what was included or not. The final version of the bill called for one added expense for homeowners: a permit that would be good for two years and could be renewed. And that was the only added expense. Once you have the OK to set up shop in Beacon as a short-term rental, you have to also be OK with New York State code, and in compliance with whatever the state says. The state has not yet defined its code requirements for short-term rentals. It drafted a law, but that law has been stalled for a long time. In New York's draft of a brand-new state law for short-term rentals, sprinklers are not mentioned, and the fire-safety requirements for a homeowner would include "conspicuously" posting a list of emergency phone numbers for police, fire and poison control. They would also need to have a working fire extinguisher. However, we asked Beacon's Dutchess County Legislator, Nick Page, if he knew of any movement on that new bill. "Not as far as I know," was his answer. If there is no code specified, Beacon's Building Inspector, Timothy Dexter, has stated that he would go by the Bed and Breakfast fire code, which requires sprinkler systems in the home or an egress window that can be pushed out. Homeowners found that threatening and not affordable. However, if New York State completes their law, this could all be a moot point. The Beacon law was requiring that homeowners comply with New York State law - which people need to do anyway with state laws. Beacon's law was simply to say that short-term rentals in a primary residence were OK, and outlined some rules - which did not specify sprinklers. What Was Beacon's Law For? What Got Voted "No"? Beacon's law would have legalized short-term rentals in the city of Beacon, and had nothing to do with state law (because there currently is no state law around short-term rentals). The state law could have included the sprinklers depending on interpretation by the Building Inspector, based on guidance he got from the state, according to the City Attorney. During the night of the city council's vote, the City Attorney went on to say that the state has to regulate short-term rentals somewhere, and until there is something official, that somewhere is code relating to Bed and Breakfasts. However, he noted, the regulation could be in a more restrictive area called R1, but the State is seeking the less restrictive of Bed and Breakfast. Said the City Attorney that night: “We are talking about two distinctions. What the zoning permits, versus what the state permits. You can regulate zoning, but you can’t regulate what the state code provides for.” Two different laws. Beacon's law would only have green-lighted the concept of short-term rentals in the Schedule of Uses, and how that would work. Here's a screenshot of what a portion of what Beacon's Schedule of Uses mentioned above looks like. See those line items? Behind each item on this list is how the area of interest would work, according to how the City of Beacon regulated it. The short-term rentals regulation would have put Short-Term Rentals onto this list, with certain rules to follow (here's a link to the law's final draft, which was voted down). Editor's Note: This section was edited on 6/13/2018 after more information was provided by Keith Zahra in the Comment section). Alright. Do you see Tattoo Parlors in the list above? Many years ago in 2000, under a totally different City Council, there was a tattoo parlor in town called Zahra's Studio. Tattoo parlors didn't have an ordinance at all. Much like short-term rentals don't have an ordinance at the moment (which by Beacon law, makes them illegal unless they have an ordinance defining how they should run). Some people didn't want tattoo parlors in town anymore. To lock that in and make sure the tattoo parlor couldn't operate legally, an ordinance was written and passed that banned any and all tattoo parlors. Zahra's Studio eventually closed, but not because of the ordinance, according to owner Keith Zahra in the Comment section of this article below! Said Keith in an outtake of the comment below: "[I was] Open and running for years after the statues of limitations voided any possible future enforcement of the existing tattooing laws. I had a New York State Supreme Court lawsuit filed against City of Beacon for constitutional violations. This case is a lot more complicated than the simplicity of a prohibition and a grandfather clause. City of Beacon violated tattoo artist’s rights like no other government municipality in the country, it was becoming a legal precedence in the industry." Scroll down or click here to read more about his experience with the law. Twelve years later, that rule was reversed, and tattoo parlors were allowed. 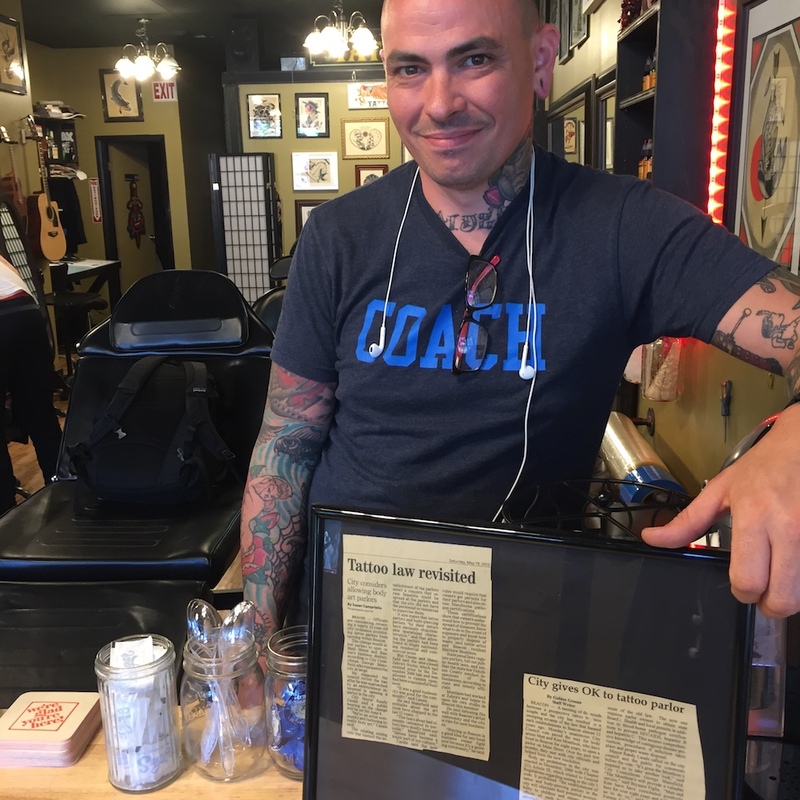 Matthew Montleon, owner of Honorable Ink, was responsible for instigating the reversal of a law that prohibited tattoo parlors in Beacon. 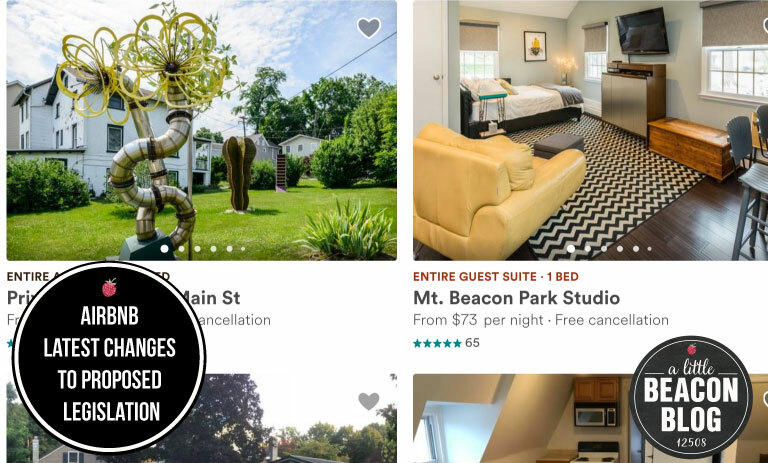 There is no law written to prohibit short-term rentals in Beacon, but City Council voted down a law written to protect them, leaving short-term rental law in the gray and beholden to default law. Matthew Montleon, founder of Honorable Ink, the popular tattoo parlor on Main Street, approached the City Council in 2012 to have this reversed so that he could open his own tattoo parlor, Honorable Ink. According to a Poughkeepsie Journal article he has framed in his establishment, he had the support of Mayor Casale and Council Person George Mansfield, who worked to reverse the rule, saying that tattoos were part of our culture now, especially in our artist-friendly town of Beacon. You may remember the videos on it as Matthew showed up to debate the topic and present his case. According to Matthew, not only did the City Council reverse the ordinance, but Mayor Casale suggested writing a new ordinance to legalize tattoo parlors, which would have set rules on how tattoo parlors could operate in Beacon, assuming they followed New York State health code and any other code New York State set. This is how legalizing tattoo parlors in Beacon in 2012 played out. This situation could be likened to the move to legalize short-term rentals in Beacon. Only this time, Council Person George Mansfield voted against legalizing short-term rentals, and the Mayor voted for legalizing short-term rentals. Even though both of them were advocating for homeowners who wanted to rent their homes out in the short-term market. It should be noted, however, that should New York State define its law, for short-term rentals, nothing changes in the Beacon law - only the requirements of the state law. Neither the proposed state law nor the Beacon law mentioned sprinkler systems or egress windows. During the night of the vote, City Attorney Nick Ward-Willis recalled how he contacted a few people at the State level to get further clarification, but was unable to find any. "At the New York State Department of State (DOS), I spoke with Justin Cartwright, Director of Legislative Affairs for the NYS Department of State (who Airbnb referred us to). Mr. Cartwright referred us to Joseph Ball, Associate Attorney in the Department of State’s Office of General Counsel. We also spoke with Mark Miranda, Regional Contact, Department of State, Division of Standards and Codes." He was unable to get clear answers on fire-safety enforcement for short-term rentals, since no law exists. Therefore, written into Beacon's law, was a requirement for the building inspector to inspect a prospective short-term rental to see if the short-term rental was compliant with "the International Series of Codes and New York State Code Supplement," and then make a recommendation from there. The city attorney also mentioned that an individual who disagrees with the building inspector’s interpretation of the International and State Code provisions may appeal to the NYS Department of State, Division of Building Standards and Codes, by filling out and submitting an application form available at: https://www.dos.ny.gov/Dcea/pdf/2078-a-f.pdf. During the Council's last Workshop on short-term rentals on April 30, 2018, the City Attorney did suggest that a way to trigger New York State into addressing the fire code issue was to file a lawsuit against New York State. Can Sprinklers Be Written Out of the Law? Moments before the vote took place during the May 21, 2018, City Council Meeting, George Mansfield asked the city attorney if Beacon's law could be written so that sprinklers were not required. The Attorney answered that the law could not, that a state code could only be added to, and not subtracted from, at the city level. "The city does not have the ability to create laws or definitions or regulations for the State building code. You could apply stricter interpretations, but you can’t have it less permissive. The city does not have the ability to influence the State code interpretation." The proposed local law required that homeowners follow New York State law, which could change at any time, given pressure to the state to complete their law. If New York State law changes, nothing would be amended into Beacon's law. Meaning, if New York follows through with only requiring a fire extinguisher and list of phone numbers, then that is what people would need to do because they need to follow New York State law. Plus, Did You Know That Major US Cities Like NYC Actually Heavily Regulate Airbnb? The headlines at major news outlets have been popping up recently. Some communities turned a blind eye to short-term rentals not being on the official list of things allowed and not allowed (like Beacon did). Others turned a blind eye, but after complaints, created legislation to officially shut down the practice (like Upper Arlington, that suburb outside of Columbus, OH). Cities like Miami Beach don't allow it in certain zones. New York Gov. Andrew Cuomo signed a law in 2016 making it illegal to advertise occupancy for short-term rentals in buildings with three or more units (here's the state law). Violators are subject to fines of up to $7,500. Beacon's proposed law imposed no limit on the amount of nights the property could rent per calendar year. Beacon's proposed law did not require the homeowner to be on the property at the time of renting. 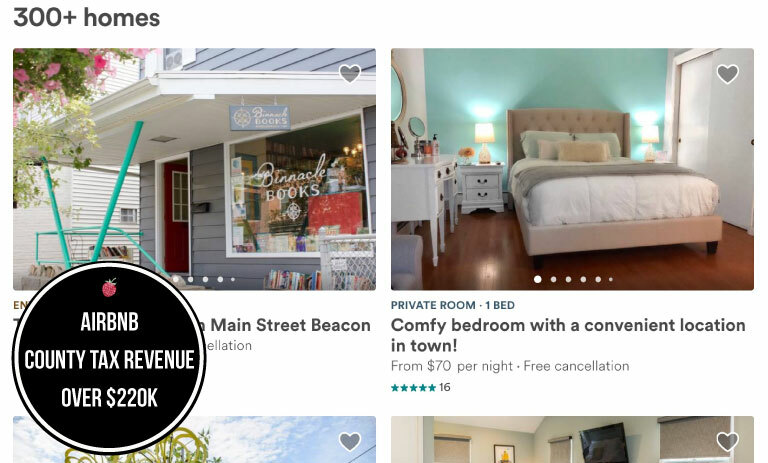 Beacon's proposed law did not restrict short-term rentals by zone. Did Beacon have a bird in hand, and not realize it? Did the council members who voted "no" do it as a bluff or statement against the sprinklers (that weren't even in the local law)? Not realizing how many of them would trigger a majority? Did that many constituents who supported short-term rentals ask their council member to vote "no," and were maybe confused about how a vote of "no" would pan out, or what it included? That this vote was a separate issue from The Sprinkler Issue? Beacon Was Being Progressive - So What Happened? The night of the vote, Council Person George Mansfield stated that his vote of "no" was contingent upon Beacon asking New York State to hurry up and decide already about their fire-safety code. However, a vote of "no" does nothing to protect short-term rentals during the time in which it takes New York State to move in any direction - which could be a long time. Additionally, if New York State did decide to only require a list of phone numbers and a fire extinguisher as their required fire code in short-term rentals, the vote in Beacon would not be retroactive. We reached out for comment from the council people and heard back from everyone but Mayor Casale, John Rembert and George Mansfield. They get a lot of emails, so we get it if ours was lost. Terry Nelson, who voted against the legislation stated: "I personally received an overwhelming amount of email urging me to vote 'no' and these came from short-term rental (STR) owners. Their rationale was that the proposed resolution was a step towards driving them out of business. My reason for voting 'no' is that the resolution did not adequately address many of the subtle nuances of STR ownership. Also, it would create a system in which only those with the financial means would be able to be in the STR business." When I asked Terry for clarification on the financial implication, Terry referred to the possible New York State mandated sprinkler system or egress window requirement that Bed and Breakfasts need to conform to. But sprinklers are not in the currently stalled New York State law, and they were not in the local Beacon proposed law. Terry referred to other fees in the proposed law, but there only seems to be a permit fee in Beacon's law. So fear of additional fees as a reason to vote no on Beacon's law is unclear, since the Beacon law that was up for a vote did not require sprinklers. Jodi McCredo, who voted in favor of legalizing short-term rentals, stated: "I did receive requests to vote 'no' as well as requests to vote 'yes.' I believe that voting 'yes' to the law, along with the resolution to request state action and a grace period on the code until the end of the year, was the bast way to help our owner-occupied short-term rental hosts stay in business while shutting down the non-owner-occupied short-term rentals that most of the community seemed to be against. The 'no' vote simply shut down everyone." Lee Kyriacou, who voted in favor of legalizing short-term rentals, stated: "There looked to be a concerted effort to encourage a 'no' vote. In my view, no change in current law keeps all short-term rentals illegal, which leaves the city free to chase them down. The proposed local law that did not pass 3-4 would have legalized owner-occupied short-term rentals." Amber Grant, who voted against the legislation to legalize short-term rentals, stated: "Throughout the entire process of crafting the legislation, I heard a lot from constituents. I also spent time with many of them, listening to their concerns and even touring a short-term rental. I thank everyone who made their voices heard." If you have seen the movie Evita starring Madonna, then you may recall the song, "Another Suitcase In Another Hall," in which Madonna sings the recurring breakup song, with the emotional line: "So what happens now?" wondering where she is going to go. The song ends with a character in the movie answering in whisper: "Don't ask... anymore..."
Here's the final proposed law that was voted on, in case you're interested in what was allowed for short-term rentals, in case it comes up again. Jeff Simms, Beacon beat reporter for The Highlands Current, got his article up about it last week, if you want another recap. Please Note: This article was originally written in April after the Public Hearing on Short-Term Rentals on April 2, 2018, but had not been published yet. It is being published now to be used as reference for an upcoming article after Beacon's City Council voted on May 21, 2018, against creating legislation to officially legalize Short-Term Rentals, thus leaving them illegal by default. Attending the Public Hearing on Short-Term Rentals was an enlightening experience to hear the inner workings of how renting out one's home - or a room in one's home - works on Airbnb. The meeting was not specific to Airbnb, but most everyone who voiced their feedback for the proposed legislation was using Airbnb and referred to it in their experience. There was not a common thread to identify a single type of person who would use Airbnb. They were men, women, single men, single women, people with young children, people who cleaned the Airbnb homes, renters or homeowners who lived below or next to a property listed on Airbnb. What Is Available in Beacon on Airbnb? 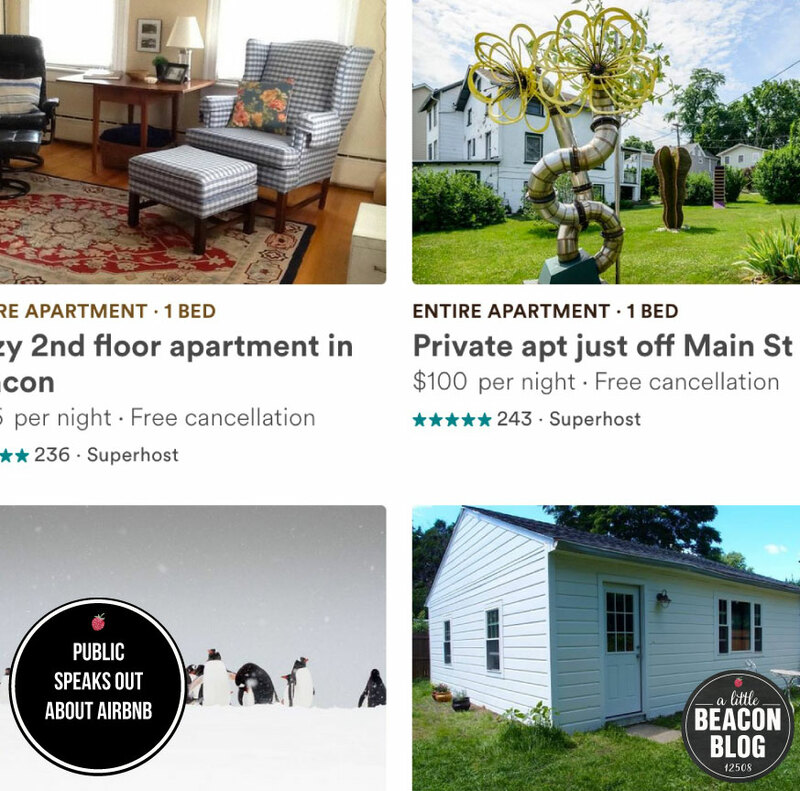 Before we get into what the public said, let's take a look at what is available on Airbnb in Beacon, and how people approach it here. The photo above includes a picture of penguins that hangs in a room available on a short-term basis. That is the "Antarctica Room" that you can rent from Aga and David, who may be in the house with you during your stay in this private room, or they can leave you in private. According to the listing, "the room currently displays an exhibition of Antarctica by your host." It comes with a hair dryer, option of a bassinet, and "the queen-size bamboo mattress is the right blend of firmness, softness and all around comfiness with lux linen bedsheets." This listing has 85 all-star reviews, and does not allow smoking, pets, or parties. What did one guest think? This Goldilocks rooming scenario is very real in Beacon and all over the world, but is largely unregulated. Beacon's city government is stepping up to the plate again, after trying once in 2014, to try to regulate it. 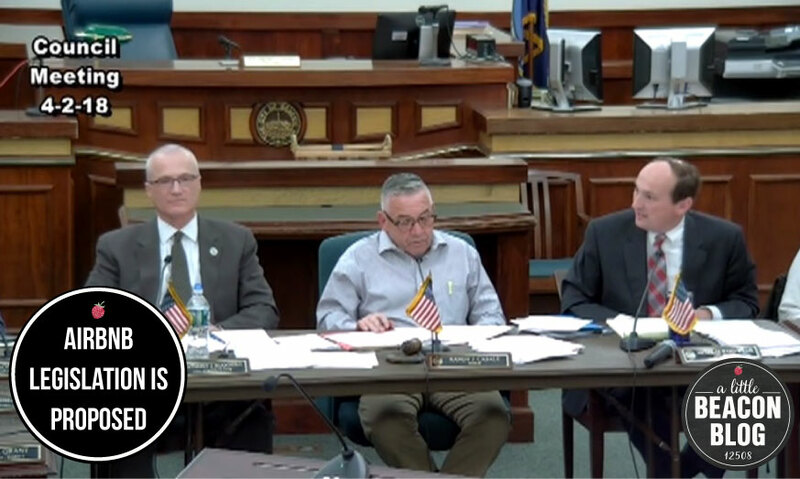 Based on recent outcry from neighbors of a house purchased as an investment property by a Beacon resident, David Allis at 51 Orchard Place, the City Council scheduled a public hearing to hear ideas and feedback from the people of Beacon. Said Mayor Randy Casale at the meeting: "Right now they [short-term rentals] are all illegal. We are trying to figure a law out to make it legal." neighborhoods, effects quality of life and has a negative impact on the rental market. Ban non-owner occupied whole home short-term rentals. Require registration and establish regulations that maintain the zoned character of our residential neighborhoods. Also submitted, but not read aloud, was a letter from Airbnb written by Andrew Kalloch (click here to get the letter titled "Airbnb testimony" who works with Airbnb's Public Policy. According Airbnb's letter, the listing service "has brought over 300 million guests in 4.5 million listings in 81,000 cities in nearly every country across the globe." In Beacon in 2017, according to the letter, there were 110 "active hosts" who served 9,100 guests. Who Attended the Public Hearing on Short-Term Rentals? Over 30 Beacon residents spoke at the podium to voice their opinions and experiences. A majority of those citizens were Airbnb short-term rental landlords who rented out all or part of their primary residence. At least two of the speakers were homeowners who had purchased at least one other home for the sole purpose of Airbnb-ing it: David Allis on Orchard Place, and the owner of Play, the kids' toy store on Main Street. The owner of Play stated: "I consider it a public service. I love Airbnb. Have been using it for 12 years myself. I go every summer with my dog and my family and usually another family, and we share a place. I offer that to people coming to Beacon. It’s a dog-friendly place, it’s a fenced yard. People love it." Some people speaking were not short-term landlords, but attended to voice favor for the practice; among them was one woman who is employed by short-term landlords to clean their homes in preparation for guests. No hotel owners or bed-and-breakfast owners voiced their opinion at this public hearing. While the meeting's purpose was to hear feedback on the experience of providing a short-term rental from one's home in general, all of the people in attendance who offered short-term rentals were doing so using Airbnb (which is not the only site to offer that service). Their feedback about renting in the short-term was interwoven with descriptions of how short-term landlords/homeowners must interact with Airbnb's rules. Several homeowners spoke about how guests are screened, and more than one attendant had children. One homeowner, theater producer Jessica Jelliffe, lives in her 100-year-old home with her husband, 5-year-old son, and a legal long-term tenant which she says covers their mortgage. When they needed extra income, she made her job to be managing the short-term rental side with Airbnb. Guests have to go through a three-step verification process that the host sets the limits for, that ensures that [the guests] are who they say they are. The star rating and the review process after the guest has stayed with us ensures that the location is what it says it is. And if anything isn’t fit or isn’t how it was described or is unsafe in any way, shape, or form, they let other potential guests know by giving a lower number of stars and/or giving public feedback or private feedback, which I always pay close attention to because it directly effects my business. As a traditional landlord. I know more about my Airbnb guests than I do about my own tenant. Speaking of long-term tenants, experiences with those were vocalized as well. Daniel Aubry, a realtor, commented that he has rented to long-term and short-term tenants, and it was his long-term tenant who caused him the most problems. "My poor neighbors had to suffer his rantings. It took me three months to get him out." Mike Diago, a social worker and father of a young son, owns the self-proclaimed "most famous Airbnb in town - an intimidating 13-foot turquoise camper" with his wife. He commented on his good neighbor policy: "I checked with all my neighbors. Triple checked. 'No problem at all, Mike.' One guest asked [my neighbor] for sugar, and I was mortified." According to Airbnb's statistics, the typical host earned about $8,800 last year by renting their space for about four nights a month, reinforcing the fact that most hosts are not full-time “commercial” operators. 70 percent of Beacon hosts are women, and the average age of hosts is 46, with 15 percent of hosts over the age of 60. Supplemental income from short-term rentals (STR) is particularly important to this population, which often struggles to “age in place” on fixed incomes.